US angler Li continued his Thailand fishing holiday with a visit to Bungsamran Lake in Bangkok in search of big catfish..
On arrival the angler quickly tackled up with a sliding float and method feeder combo and cast towards the centre of the lake. The float had barely settled before being dragged under the surface by a big catfish. As Li wound down into the unseen catfish it responded with a powerful run towards the far bank. The big catfish fought well for the next ten minutes before it was brought under control in the margins and quickly netted. 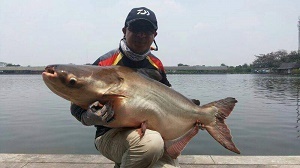 The Mekong Catfish was estimated to weigh 20kg and was released after a few photos. Further casts resulted in yet more Mekong Catfish all in the 15-20kg range. As the afternoon’s fishing continued the angler caught plenty more big catfish with several topping the 30kg mark.